I'm currently reading a most worthy book about data quality, and, like most other books about data quality I've come across, its gaze is fixed completely on data held in large corporate entities. Large companies where data is amassed across myriad systems, current and legacy; where there is a separate IT department; where there are enough staff to create a data quality working group; where money is no object when it comes to tools to assess, process and cleanse that data. But is that really where most of the world's data is held? Obviously it's where we most come in contact with it - when a large utility messes up its invoicing procedure, we know about it very quickly - but I would guess that more data is held in small spreadsheets and databases and documents in small- and medium-sized companies than is held in large corporations. I'm obviously not typical, but my own databases hold around 40 million records. In these small companies, there is unlikely to be distinct marketing or IT departments, no budget for data tools, not enough staff to create DQ teams. OK, so I've bitten the bullet. Much against my better judgement I'm making a concerted effort to learn Microsoft Access 2007, to allow me to produce some data tables with Unicode characters. and we see how it is made up. '0' indicates a required digit, 'L' a required letter, and '>' forces upper case. Thus, whilst this mask can take OX19 6RY, it can't take OX9 6RY or SW1A 4WW or S1 1AA or N45 1AP or .... well, most of them. 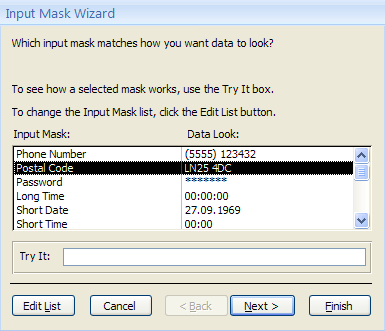 Microsoft may feel that they are being helpful by adding this sample mask, but we all know that programmers, like most of us, will take any route that make their life easy, and are unlikely to make any attempt to alter this input mask to make it valid for the UK, let alone valid for postal codes in every other country. And we know that this happens - my God, don't we all suffer regularly at the hands of forms designed like this? 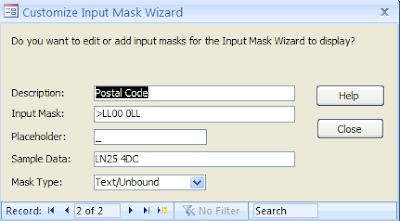 Many programmers would not even be aware that the mask is not valid for most UK postal codes - they trust that the software provider has done their homework. Back to the drawing board, please, Microsoft. This is not helping in the fight for better data quality. Another great example of how ignorance affects data quality from web forms (and can lose customers and money!) has come my way, this time courtesy of the site Flying Share. Flying Share are offering their users in the US, UK, Canada and Australia, via this form, a free USB drive. All well and good until you get to the "ZIP" field (ZIP? Not outside the USA, good people of Flying Share - you probably mean "Postal code"). And there you find that the field will accept five characters and no more. So anybody in the UK or Canada wanting a free drive must either give up at this point, or provide a truncated code. As drives are being sent out postally, there will clearly be a huge problem of undeliverable and returned drives. I know that this error has been pointed out to the company concerned, but no action has yet been taken, though correcting it would take seconds. I do wonder at what point anybody at Flying Share will feel the need to act on this. Perhaps when the costs of returns reaches astronomical proportions? How many (potential) customers might they have lost before then?